The genus Butia, the so called pindo palms, are native to the grasslands of southern Brazil into Uruguay, Paraguay, and Argentina. They also are known as jelly palms since their large yellow-orange fruits can be used to make reasonably good tasting jams. They have the added benefit of being some of the more cold tolerant palm trees, taking several degrees of frost before showing signs of distress. Perhaps the most celebrated of the genus is B. capitata, a palm that has a long history of cultivation in western gardens. This species is a pinnate palm, often called “feather palms”, since their fronds are long feather-like affairs with a central leaf axis (known as the rachis) supporting rows of long, simple leaflets (known as pinnae) extending down its length. As with many commonly grown plants however, its story is quite a bit more complicated than what one would first imagine. Pindo palms have a very distinctive look due to their highly recurved, blue-grey fronds. 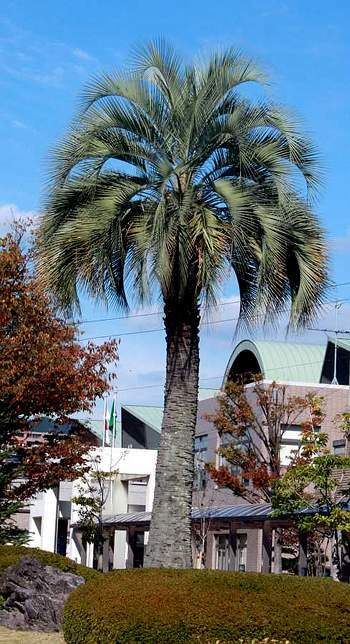 This large specimen is growing next to a public building in Sasaguri Town in Fukuoka Prefecture, Kyushu, Japan. The pindo palm typically grows between 3.5-4.5 meters tall, but can reach 6 meters or more in vigorous specimens. 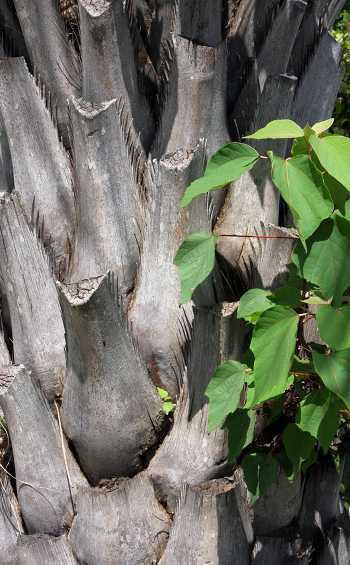 Its trunk is singular and thick, typically between 30-50 centimeters in girth, and very often covered with old petiole bases (leaf stalks) that can persist for years. Clear trunks are grey in color and patterned with old leaf scars, giving it a horizontally banded look. The fronds are pinnate in form, growing between 1.5 and 3 meters long, and arch in a recurved shape back towards the trunk, giving this palm it’s signature look. Their overall color is commonly blue-grey, but can be light green depending on environmental and genetic factors. The rachis supports opposing rows of regularly arranged pinnae up to 75 cm long each, the longest being mid-frond, and held in a pronounced “v” shape. The petioles are armed with abundant, long teeth, as can be seen in the persistent leaf stalks. Plants grown in poor soils or more sun tend to be more compact than average specimens. Flowering normally commences in late spring to early summer. The yellow-cream flowers grow in large, stalked bundles which can be up to a meter long with many side branches. The ovate to rounded, brilliant orange fruits are borne generously in tight clusters from late summer into fall. They average between 2-3 cm across. The “true” Butia capitata is native to a very confined area in the coastal states of Bahia and Minas Gerais in central Brazil. Now for that aforementioned complexity about this palm. Apparently most of them cultivated around the world are NOT B. capitata, but rather are a different species, the most probable candidate being the recently named B. odorata, a native of the coastal areas of Uruguay and the adjacent state of Brazil, Rio Grande do Sul. To complicate matters more, several species of Butia from the surrounding region, notably B. eriospatha (confined to southern Brazil), B. paraguayensis (a dwarf widespread species), and B. yatay (a taller growing palm with a thicker trunk) are being grown as well. Butia species readily hybridize, so it is also possible that the great range of variation seen in cultivated plants is in fact an artifact of interbreeding. Go figure. The fronds of pindo palms are composed of opposing pairs of long leaflets known as pinnae arranged along a central leaf stem. This appearance has given this type of palm the common name, “feather palms”. Butia species are one of the most cold hardy of this group. All Butia species are native to grasslands and dry open forests ranging from southeastern Brazil, into Uruguay, Paraguay, and northeastern Argentina from near sea level to over 1000 meters elevation. They can be found in the Cerrado region of Brazil (an area comprised of various types of savanna where woody species are plentiful), sandy-soil grasslands, pasturelands, the restingias ecoregion (dry coastal forests of the Atlantic coast) and campos (grassy plains with few trees). Species growing in the inland/upland areas are subject to fairly severe frosts with little protection, and so can be assumed to be far more cold tolerant than coastal populations. If it is true that most pindo palms in cultivation are derived from B. odorata stock, a species found only in the restingias of coastal Uruguay and Brazil, one would expect these plants to be rather frost tender. Remarkably however, most sources consider typical plants in the trade to be cold hardy to at least -10 C (14 F) without any winter protection. With some protective measures, plants have been grown in far colder climates, apparently being rather commonly seen on the eastern coastal plain of the USA as far north as North Carolina with outlying specimens being grown even up to Washington, D.C., New Jersey and Long Island, in New York State. Even the northernmost part of this area has moderately long, hot summers, suggesting that this palm requires long warm periods to recuperate from winter’s cold. This apparently is not quite true either, since specimens have been successfully grown in the Pacific coastal states of Oregon and Washington, as well as the adjacent parts of coastal British Columbia, Canada. Growers in the UK and Ireland too have had success growing these palms in the most frost free areas. The one caveat is that palms grown in cool summer climates are much more susceptible to rot in the crown’s meristem, so every effort should be used to keep winter rain and snow off them. Having said all this, without a doubt, growing plants in hot summer areas will yield better results, both in terms of overall growth and long term viability. With all of this in mind, I would rate these palms to be fully hardy to the equivalent of USDA cold hardiness zone 8 provided summer temperatures commonly exceed 30 C (86 F). Further, I would rate them as marginally hardy/on the edge of endurance in zone 7b, and not viable in 7a or lower. Of course, where they are sited can have a big influence. Protected, sunny courtyards next to a building with a southern aspect, for instance, may push the local zone quite a bit. Butia flowers are borne on meter long stalks. They typically flower May and June in southern Japan. Drier conditions in winter will also have a big impact on long term survivability. For example, a grower in zone 7b, west Texas should have greater success than say a person in coastal New Jersey in the same zone. Results will vary widely however, given the uncertain origin of plant stock, the variability of the local climate, and how plants are grown by individuals. 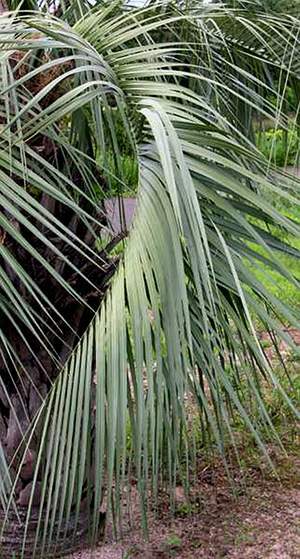 These palms are native to regions with generally poor, sandy soils. For that reason alone, it is necessary to keep the growing area well drained, particularly during cold periods. Boggy sites, poor draining soils, and swamps should be either avoided, or the growing site needs to be modified to provide adequate drainage. This is most easily accomplished by elevating the growing area by mounting up the soil. Given these are large trees, this mound may need to be extensive. These are not particularly sensitive trees with regard to soil type however. I’ve seen equally vigorous specimens in north Florida’s deep, rapidly draining sands, as well southern Japan’s rich, volcanic loams. In both cases palms are subject to strong monsoonal summer rains without any detriment to their health. Soil reaction can vary from moderately acidic to neutral (~pH 4.5 – 7.0). To grow pindo palms to their greatest potential, it is best to give them full sun, though they will tolerate moderate shade (with high, bright shade being best). Likewise, even moisture will greatly benefit them, though once established these are very drought resistant palms. Fertilizer should be given in warm weather, but be careful not to over fertilize – for example in highly maintained lawns where nutrient levels are more than sufficient for these palms. Luckily, this tree is fairly disease free with the occasional infestation of leaf miners and scale. Any appropriate insecticide can be applied to control these issues. Pindo palms have very persistent leaf bases that remain attached to their thick trunks for many years. The plant on the right is a common weed tree in Japan, Malotus japonicus, growing within the old leaf bases. In higher pH soils (neutral and above) and very dry, poor soils you may notice micronutrient deficiencies. Frond length may be shortened and their color may be pale. The best way to combat this is to bring the pH down by adding compost, manure, peat, or any other organic matter to the area. Be careful to avoid prepared composts that contain lime. The addition of elemental sulfur as well can bring the pH down, but refrain from adding acids to the soil directly since this is dangerous to the plants and may cause unhealthy side effects in the soil as well. Propagation is from seed. Allow seeds to fully mature, remove the flesh, and then dry before planting. Dry seed should be treated with a fungicide before being put into a sealed plastic bag, and kept above 18 C (~65 F). Butia seem to need this dry period before planting out. Unfortunately, Butia seeds are notoriously difficult to germinate, taking as much as two years using normal techniques. Some have found it better to crack the hard seed coat (the endocarp) to facilitate germination. Broschat found the complete removal of the endocarp increased germination dramatically (see the full article here). The time for germination is sped up also with higher temperatures with 40 C (104 F) being cited as optimal. As with many palms grown from seed, these are very slow growers at first, having to build up a good root base and stem before “taking off”. Therefore, those wishing to have a full grown tree quickly should buy either large subadults or adults at the get go – a more expensive option, but not unreasonable. The very interesting “mule palm” (X Butiagrus nabonnandii) has been created by hybridizing Butia (putatively B. capitata) with another South American feather palm, the queen palm, Syagrus romanzoffiana. The resulting plant is not surprisingly somewhere between the two parents in both looks and cold hardiness (likely not much more hardy than zone 9, or perhaps 8b). 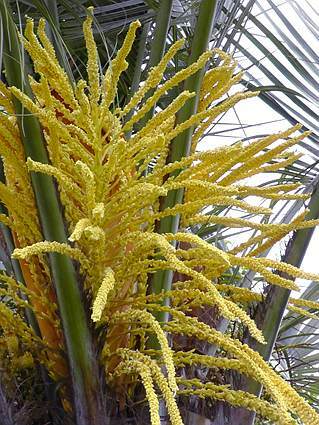 Without a doubt, it is a lovely palm for the garden, having a more tropical appearance than a straight pindo palm. As its name implies, it is sterile, meaning it cannot make viable seeds. Butia species are well known for their large, orange-yellow fruits. B. capitata fruit are oval whereas these round ones are more like those of B. odorata. All are edible. As with other palms, when pruning their crowns, don’t overdo it. The “10 to 2” pruning method works fine for them, meaning cut only the fronds below the clock positions of ten o’clock and two o’clock. Ideally, leaving at least half the crown is even better, and if you wish, only remove the dead fronds. Having said that, I’ve seen a local specimen “get butchered” every winter (complete frond removal) in my neighborhood and the darn thing always has a full crown of fronds by the end of fall. Longterm though, such pruning will only weaken your palms. I would refrain from trying to remove the petiole bases as well since they cleave to the trunk keenly – besides, they are very well equipped with long, spine-like teeth, so attempted removal may end up hurting you more than the palm! In the southern USA, where these palms have been grown for decades, people commonly call them pindo palms, apparently after the Brazilian town of Pindó in the State of Mato Grosso do Sul where the trees were first discovered. The fruits have long been coveted as a seasonal treat in the south, often used to make jams, hence its other common name, jelly palm. The taste is both sweet and tart, and said to be a mix of fruits ranging from apples to apricots to bananas. Local growing conditions can supposedly effect their flavor. Some folks apparently make a fermented wine from them as well. See this link for both a jelly and wine recipe. As a side note, their fruits have been used by people native to their natural distribution in the preparation of juice, jelly, and even ice-cream. Faria, et al. 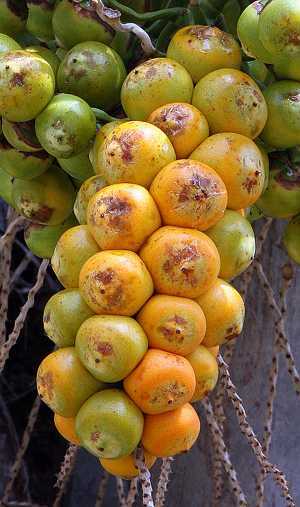 (2011), have found Butia fruit to be high in beta carotene and provitamin A. Here is perhaps the most beautiful of the cold hardy feather palms. Butia are distinctive in look as well, adding that signature recurved frond shape to your garden’s palette of forms. Disease free, cold resistant, and needing little care – the pindo palm may be the perfect answer to that tropical look you’ve been trying to achieve. Thanks Lisa. Yes, indeed, palms can have aggressive root stock and so care should be taken when choosing where to plant them. Usually the biggest problem is that folks plant them too close to walls and foundations. Plumbing could certainly be a problem too if you plant them too close to underground pipes and septic tanks. Of course their root systems have a limited range, so you probably can still plant them safely if you know where vulnerable underground systems are ahead of time. To my knowledge Butia fruits contain one, black seed which is not eaten. I don’t know about the effects of eating Buita seeds, but certainly the skin and flesh are edible no matter what species you have. I wonder if you aren’t talking about the palmyra palm, Borassus flabellifer? It has a coconut-like fruit with three sections in the inner fruit which can be eaten like a coconut. This palm has spineless fronds, so maybe that is the palm you mean. The only problem with this idea is that palmyra palms are cold sensitive, so unlikely to grow in Sacramento. A mystery! i have a pindo that made fruit one year, but for the last 2 years, the flowers come, and there are tiny fruits forming, then they just fall off, without ever developing. why are they doing this? i’m in north florida, and the tree looks great and is growing well. could fertilizing help? Problems with palms can be hard to diagnose without seeing the cultural conditions. If newly planted it may be still adjusting, or it may not be adjusting well. If there is a problem with an established tree (say over 10 years at one spot), then either watering/fertilizing or environmental conditions may be the problem. Things to consider: 1. 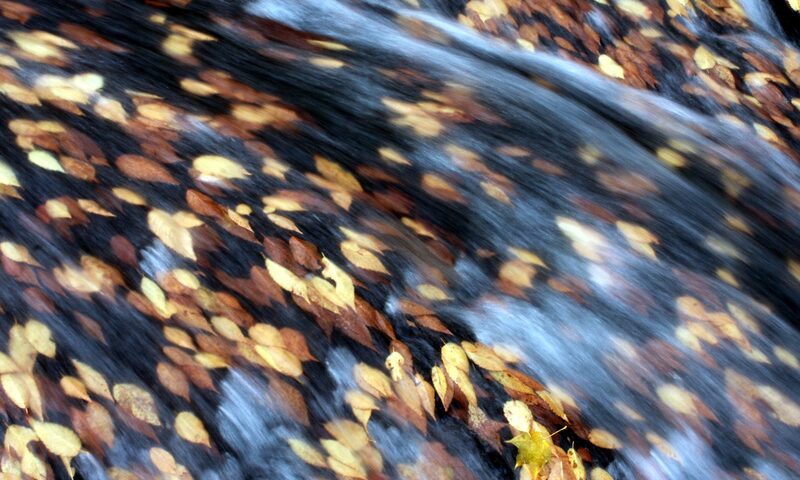 If your tree is watered on a regular basis by an irrigation system, it may be getting too much water. If it gets no water beyond rainfall, it may be not getting enough water (particularly in an exposed site that is well drained like a sandhill). 2. If your tree is in a lawn that is fertilized regularly, it may be getting too much fertilizer, but if it is in a field and gets no supplementary feeding, it may not be getting enough fertilizer. 3. These trees need full sun to near full sun to flower and fruit properly, so that may be another consideration. When should I buy and plant them? How much space should they be apart? How far away from a septic tank should it be?